Frankie Cosmos was born in the bedroom of Greta Kline. Evoking both the plain and ethereal, the name is one of many monikers the young New Yorker has used to release her brand of sun-dappled indie, which like the nomenclature, marries the mundane with the day-dreamy to talk about everyday subjects like growing up, while being underpinned by honeyed alt-pop musicianship. Since being conceived as a solo project in 2011, Frankie Cosmos has blossomed into a four-piece, taking in the talents of David Maine (bass, keys), Lauren Martin (keys, synths, vocals), and Luke Pyenson (drums). Together the group released their first studio album Next Thing last year, which garnered critical acclaim from all corners and has seen them travel the world to share stages with with fellow DIY luminaries Girlpool, Porches and Alex G.
You've made music under numerous different names eg. Ingrid superstar, Greta, Little Bear, Ingrates, Zebu Fur, Franklin Cosmos, and most recently Frankie Cosmos. Why did you settle on that name for the latest incarnation? I was kinda just bouncing around different project names until I found the one that felt right. I always wanted to find a name that worked as both a band name or a solo name. Did you ever expect your collection of Bandcamp uploads [Kline has released in excess of 40 Bandcamp exclusives] to land you a music career travelling the world? In your travels have there been any specific places that have been unforgettable, for better or worse? I never expected it, it's still unbelievable to me every day! I remember most places we have been to, but one show I think I will remember forever was in Fargo, North Dakota on a tour a few years ago -- there were only maybe two people there who weren't performing or working at the bar. It was a really fun night! When on the road has your band got any tour jams that are constantly on repeat? If so what’s currently on rotate? Definitely! We love 'Face Down In The Gutter Of Your Love' by Dent May, and the latest Kero Kero Bonito album, Bonito Generation. 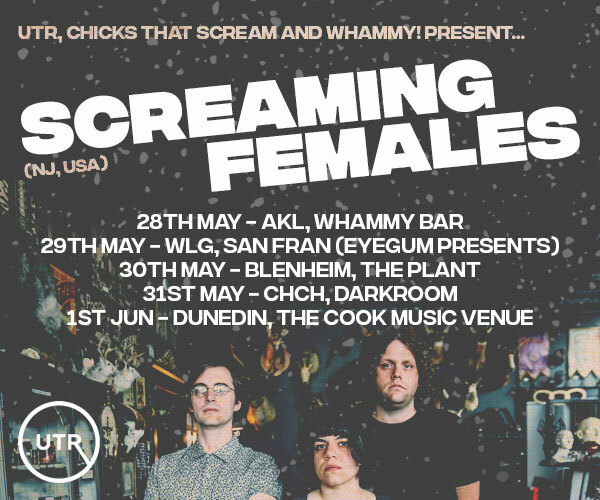 You’re coming to New Zealand for the first time next month. Are you familiar with any of the music from this end of the world? I don't know much music from New Zealand - I can only think of The Clean, The Bats, and Flight of the Conchords! More generally speaking, are there any “undiscovered“ artists that you follow that you think deserve more recognition? Nice Try from Bloomington, Indiana, and iji of Seattle, Washington! You have a knack for constructing catchy tunes that easily get stuck in my head for hours on end (not a bad thing at all!!) What is your thought process behind the songwriting? Do you set out to purposely write catchy riffs, melodies and choruses? I don't set out to make my songs catchy necessarily, but often the catchier ideas are the ones that get turned into real songs -- like if I scrap an idea but later I realize it's stuck in my head, then I end up working on it! Frankie Cosmos music has been described as low-fi, indie pop with a slightly contemporary feel, and it seems as if you have your own little niche within the lo-fi genre. How do you personally describe your overall sound when asked? Do you think your music fits into a specific genre? I usually say "rock n roll" but I guess "indie rock" is the vibe? I don't really understand genres, I just have a hard time hearing music that way. You are the daughter of two prominent actors [Kevin Kline and Phoebe Cates], how has this affected your music career and carving out a name for yourself in the New York scene? What has been the biggest hurdle? Starting out I was never really trying to make a name for myself in the New York music scene... I was just a teenager who wanted to play my songs. When I was first playing shows, most people just thought my name was Frankie and didn't know/care who my parents were, so it didn't really affect my "career". Once people started writing about my music though, it became a Fun Fact that people like to draw attention to. It's never been a hurdle, but it's a bit weird to be asked about my parents in every interview. Not something a lot of artists have to talk about, and it's not really relevant to my band. Is there a story behind the title of your latest album, Next Thing? I was titling all my demos under the album title "next thing" on my computer until I could come up with a better title for the next album. But I ended up liking that one haha! You've released music with your band Frankie Cosmos and also solo work under your name Greta Kline are there any specific differences between the creative processes that go behind making and producing the music? So far I've only released one album (Next Thing) with a full band and it was definitely a totally different process. All my band members write their own parts around my songs, so it's really fun to have so many different ideas working together. And of course the way we record full band is very different than how I recorded my solo demos I released. Your lyrics seem to truly connect to your listeners, why do you think this is? I think it's because I don't try to hide anything from the listener. I open up and give a lot of personal emotions in my writing, and some people connect back with that. It's like friendship! In Next Thing you have a song called ‘I’m 20’. What has it been like transitioning into your twenties from the somewhat infamous teen years of your life? I'm constantly going through changes and learning new things about myself. I still feel like I'm 16 sometimes, so I guess the answer is -- I haven't transitioned well into my twenties? Or maybe that's how it's supposed to be? Here’s some quick fire questions to finish off~~!! Favourite day of the week: Wednesday when I'm home, because I have family dinner. Saturday on tour because we have the best shows.